Biography: Originally from Baltimore, Md., Roy Calligan went to work in the art glass field with August Miller Studio, while receiving formal training at the Maryland Institute of Art night school. Roy would later move to Conrad Schmitt Studios in Milwaukee and then entered military service during World War II. After the war he would work at Hunt Studios in Pittsburgh where he was a design director for 12 years. 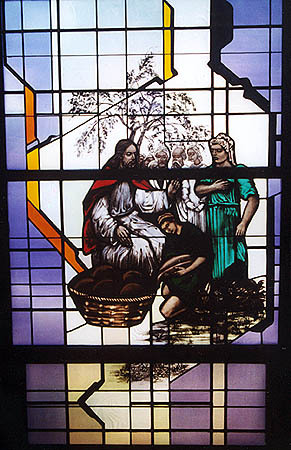 In 1967 he went into business for himself in Maryland, Calligan Stained Glass. 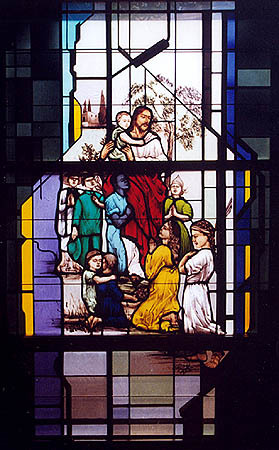 Calligan was a master of a French glass technique called dalle de verre ( faceted glass). With this technique, one-inch slabs of Blenko glass were cut into the desired shapes, hand faceted, laid into a form with sides and then an epoxy matrix is poured around. This faceting causes light to be refracted through the glass at different angles. The effect is quite different from conventional stained glass, and faceted glass yields a deeper, more jewel-like color as light passes through it.